I planned to eat at Taco Punk once. I ended up eating there three times in a week. The tacos are seriously good here and I could eat them every single day. For a week, I almost did. If it weren’t for the plethora of amazing restaurants in Louisville, I would be happy eating only at Taco Punk. Prior to eating at Taco Punk, I e-mailed to ask what is gluten-free on the menu and what items would work for a vegetarian. I got a prompt reply telling me which items are gluten-free and vegetarian. On my first visit, it became apparent the staff were also in the know, handling my order with care from the minute I mentioned my order needed to be gluten-free. While the housemade tortillas are not gluten-free, I was offered corn tortillas which are stored separately. Yay! My favorite dish at Taco Punk is the veggie mole. Usually mole is off limits to me, since many moles are thickened with bread or a gluten-full flour. 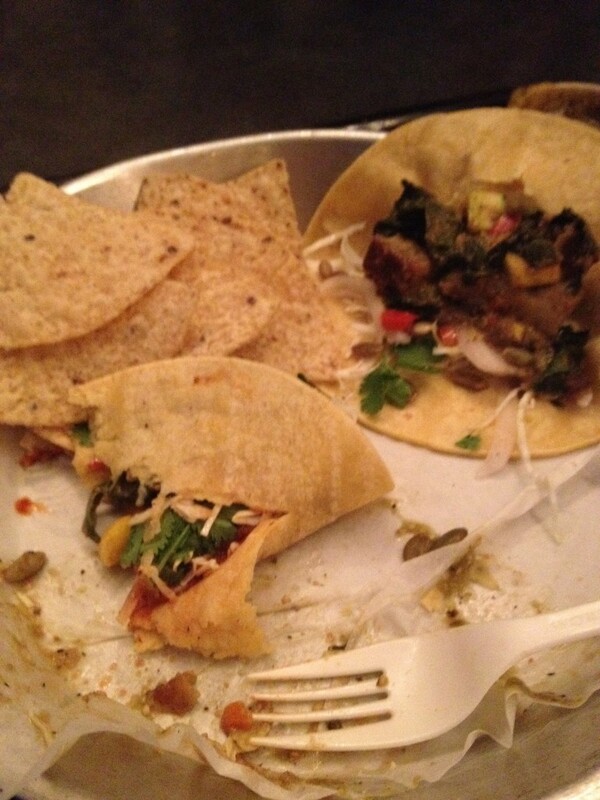 Taco Punk has a pumpkin seed mole and it’s everything I like in a mole: thick, rich, savory with a hint of sweet. And gluten-free! The platters at Taco Punk are a great value. For about $10, I got two tacos, chips and salsa plus a side. On two visits, I had guacamole for the side. It’s good stuff! Tacos are dressed to your liking. For me, this means shredded cabbage, pickled onion and pineapple habanero salsa. With chips and salsa plus a side, one taco would have been a plentiful meal, as they are stuffed with the veggie mix that is prepared when your order is placed. I would guess even the heartiest of appetites would be satisfied with the two taco platter here. 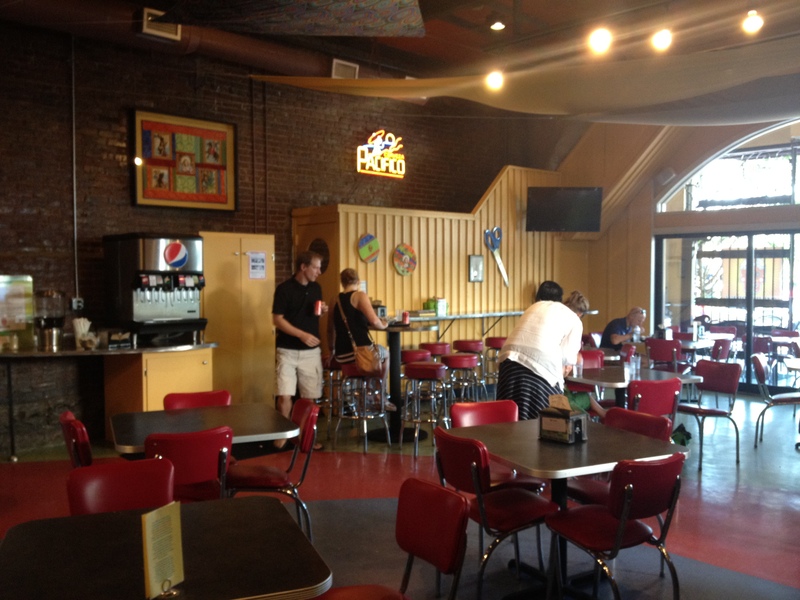 Taco Punk is in Louisville’s Nulu neighborhood, the East Market District. I enjoyed window shopping and checking out the other bars and restaurants in the neighborhood. It was nice to have a little time before or after dinner to browse the neighborhood, which was full of other folks doing the same. If you are going on a Friday or Saturday night, be prepared to wait a bit for a table at many restaurants and to park a block or two away. Taco Punk is located at 736 E. Market Street, Louisville, Kentucky. 502.584.TACO. EAT WITH: Minimal caution. 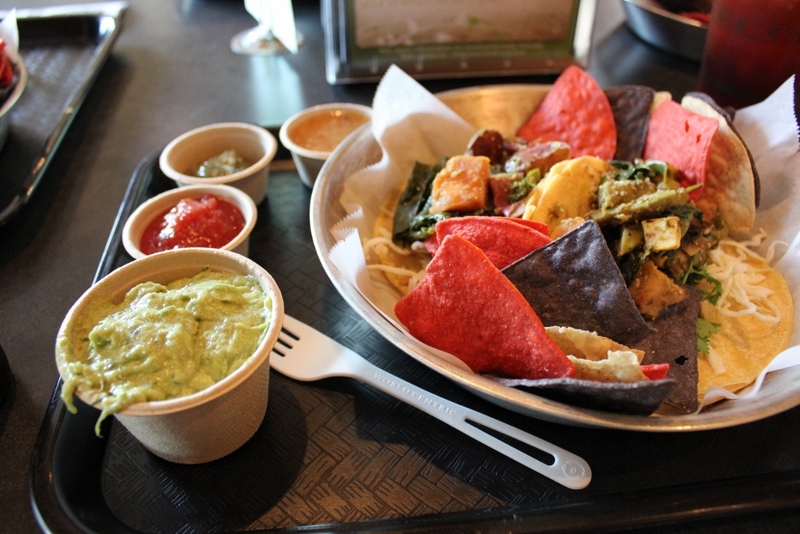 Be aware that the housemade tortillas are NOT gluten-free, but a gluten-free corn tortilla is available, just ask! Boy, does that look good! Taco Punk looks like an attractive, fun place, too. 🙂 Thanks for the review, Johnna! I agree! Love Taco Punk and sharing a meal with you would be FUN!! I too am a big fan of Taco Punk. I eat there about once a week. You should try the grilled fish taco, it’s the best in town that I know of. They sometimes serve Amber Jack, shark and tuna, all of them are great. Thanks for the tip, Steve! I’m vegetarian, so wouldn’t have tried the fish. Your comment will be helpful for those might. I appreciate it!